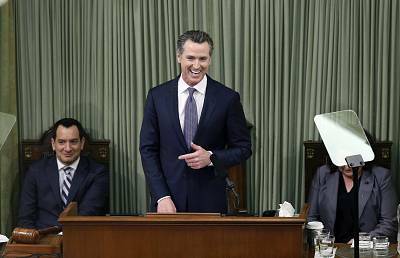 California's new governor, Gavin Newsom, sharply scaled back plans to build a high-speed train from San Francisco to Los Angeles on Tuesday, saying the program had been botched and cost too much. Speaking in Sacramento in his first State of the State address since he succeeded Jerry Brown — who, like Arnold Schwarzenegger before him, had strongly promoted the bullet train as governor — Newsom said he would proceed with work on a 160-mile stretch in the state's Central Valley where construction is already underway. "High-speed rail is much more than a train project," Newsom said. "It's about economic transformation and unlocking the enormous potential of the Valley." And he left the door open to completing the state-spanning system at some point in the future, promising to continue pursuing federal and private-sector funding for the larger project, along with environmental work and regional projects north and south of the Central Valley. "For those who want to walk away from this whole endeavor, I offer you this," he said. "Abandoning high-speed rail entirely means we will have wasted billions of dollars with nothing but broken promises and lawsuits to show for it." When state voters approved the massive bullet-train plan in 2008, the project was envisioned to open in 2029 at a cost of $32 billion. But the California High-Speed Rail Authority last year pushed the completion date back by four years and said it would cost at least double. Newsom on Tuesday blamed oversight failures and a lack of transparency, saying he wasn't "interested in repeating the same old mistakes." He said he would name Lenny Mendonca, his economic development director, as the authority's next chairman, with a mandate to "hold contractors and consultants accountable to explain how taxpayer dollars are spent" and to put all expenses online "for everybody to see." But Newsom said it was more important to "just get something done" by completing the segment that will connect Merced to Bakersfield now. Referring to money the state has already received, he said, "I am not interested in sending $3.5 billion in federal funding that was allocated to this project back to Donald Trump." Brian Kelly, chief executive of the rail authority, said he was "eager to meet this challenge and expand the project's economic impact in the Central Valley." 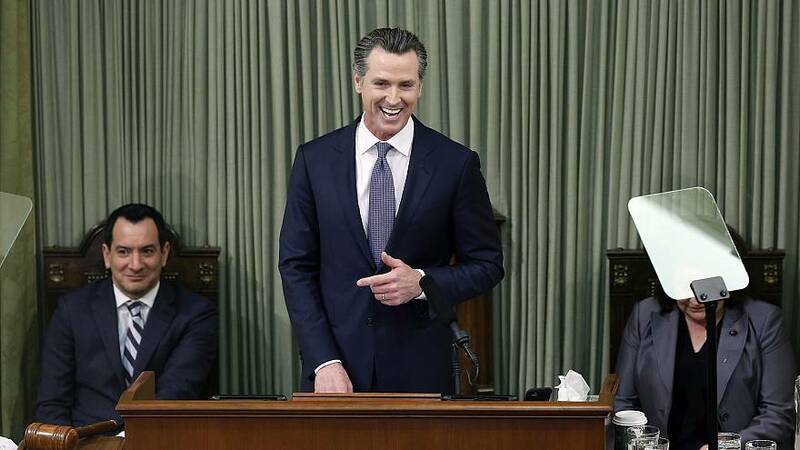 Kelly also said in a statement that he welcomed Newsom's commitment to complete environmental work statewide and to seek continued funding toward a rail project connecting the Bay Area and Los Angeles. U.S. Rep. Kevin McCarthy, the House Republican leader who represents the Bakersfield area, said Newsom made "the right move," and he called the larger project connecting Northern and Southern California "the train to nowhere." But state Sen. Scott Weiner, a Democrat who represents part of the San Francisco Bay Area, stressed that Newsom hadn't killed the statewide plan. "He said we must focus on completing [the] Central Valley segment and then move forward from there," Weiner said on Twitter, adding: "The Bay Area and Los Angeles must be — and will be — part of California's high speed rail network."